Run this checklist to ensure your new client is set up with everything they need ahead of the go-live date. Many MSPs overlook critical onboarding considerations, missing the point of onboarding completely. They choose to make the entire process more difficult and tedious than it needs to be. It's not surprising that the mishandling of this critical opportunity to set a solid groundwork leads to a negative experience for the client, resulting in poor long-term retention and increased early churn. If you nail these four components, you've nailed your new client onboarding. 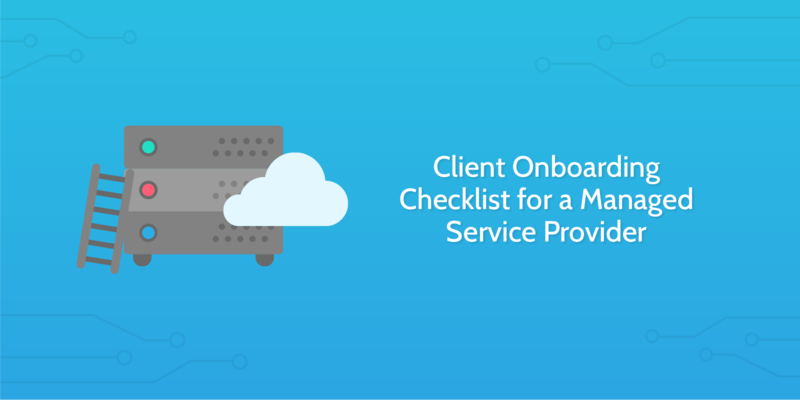 This checklist is designed to transform your onboarding process from a grueling labor into a strategic enabler that will produce more satisfied clients, reduce churn, and form a strong foundation for a long-term (hopefully recurring) working relationship. The process should be a tool to instill confidence in your new clients, as well as a management device to streamline the first, most important steps in a new client engagement. Let's get started with the checklist! First of all, record some basic information about this client using the form fields below. Upload the managed services contract to the form field below. Send the managed services contract to your client for signing with this email widget. You shouldn't have to do anything, since the body of the email has been prepared for you, pulling in all relevant data automatically. Simply check the text and hit send when you're ready. Once you receive the contract back from the client, make sure it's signed and upload a copy to the form field in this task. Help your client to feel welcome by sending over an email with a curated selection of content. This is kind of like a "getting started" pack with the aim of providing value, whilst trying not to overwhelm the client. Once you've decided on the content, use the form fields below to gather links and other resources. Perhaps you already have a welcome email prepared for situations like this. If that's the case, simply proceed to the next task. Edit the email contents below as you see fit, then hit the send button when you're ready. Save time by setting up one of our email integrations to automatically send this welcome message whenever you run a new version of this checklist. Take a moment to send off a questionnaire regarding your new client's current software and hardware setup. You'll need to insert a link to your own questionnaire into the body of the email below; other than that, just make sure the information looks correct and send it off. Once the client has competed the questionnaire, record a link to it here. Check the text in the body of the email below, then hit the send button to schedule a kickoff meeting with your client. Check the text in the body of the email below, then hit the send button to schedule a date for setting up new managed services for your client. Use the email widget below to schedule any quality assessment meetings with your new client. Check over the text in the email template and then hit the send button once you're happy with it. Confirm the date of the kickoff meeting with the form field below. Confirm the date of any setup that needs to be performed with the form field below. Confirm the dates of all quality assessment meetings using the form fields below, using the sub-checklist to keep track as you go. Prepare an agenda ahead of the kickoff call, with points that you'll want to go over with your client. Use the form field below to record the agenda. Use the meeting agenda above to guide your discussion with the client. As you progress through the call, record notes in the form field below. Following the format of the previous task, discuss the client's needs and record notes in the form field below. Discuss and agree on a go-live date for this project with your client. Once you've settled on a specific date, record it in the form field below. Prepare a list of tasks for your client to complete to achieve their first milestone and complete the onboarding process. Use the form field below to upload a task list. Prepare a project schedule indicating key success milestones. Upload the schedule to the form field below. Send the task list and project schedule you have prepared for your client to help them get fully onboarded. The email template below contains all of the information necessary, so just give it a look over and click send if the information looks correct. Make sure the remote monitoring and management agents are fully installed. Use the sub-checklist below to keep track of the installation process across all of the client's machines. Make sure antivirus is installed on all of the client's machines, using the sub-checklist below to keep track of installation progress. Send your client an invitation to attend an upcoming webinar, or direct them to a resource where they can watch previous webinars. Check over the contents of the email below and add your own webinar links; then, simply hit the "send" button. Inform your client where they can get help and learn more about your company and process. If you have a knowledge base or wiki link, this is a great time to share that with them. You want to make sure all of your clients can answer common questions and not feel lost during the onboarding process, so it's important that you let them know where they can stay informed and educate themselves. Edit the email template below to include links to your own knowledge base or support resources. Copy and paste the above information into your PSA, CRM or project management software of choice. You can automate CRM and project management updates with one of our 1,000+ app integrations. You've already confirmed the go-live date in your kickoff call with the client; now send them a reminder email with the date you agreed on. The information is already prepared for you, so all you need to do is check it over and hit the send button. Take notes during your 30 day progress review and record them in the form field below. Assign this to marketing with our task assignments feature. Use these notes to prepare a full report and upload it to the file upload form field below. Send your client the first progress report using the email widget in this task. All of the information is already prepared; simply check the contents and send it when you're ready. Take notes during your 60 day progress review and record them in the form field below. Take notes during your 90 day progress review and record them in the form field below. With your new client fully onboard, it's time to send over a feedback questionnaire. The link to your feedback questionnaire is already in the body of the email below; just make sure the information looks correct and send it off. Once the client has completed the feedback questionnaire, insert a link to it in the form field below.